Many of Kris Campbell's memories grace the pages of her extensive collection of family photo albums; like the trip to Alaska and the moment she became a mother. But the photos also tell a sadder tale, one of a brain cancer diagnosis. In 2004, doctors diagnosed Campbell with a Grade 2 Astrocytoma Tumor. Campbell was diagnosed with brain cancer at 34 years old. Photo courtesy the Campbell family. "The statistics when I was diagnosed indicated that there was a five-year 50 percent survival rate and a 10-year 30 percent survival rate," said Campbell, now 46. With a deadly disease and limited time left, the Campbells acted immediately. "Sitting back and feeling sorry for yourself when something so devastating happens isn't the path for change," she said. What she didn't know all those years ago was that she would beat the odds. While she's 12 years beyond that diagnosis and doing really well, her fight to eradicate brain cancer is as fierce as ever. Campbell gave birth to her first son after the diagnosis. He’s one of the many reasons she fights. Photo courtesy the Campbell family. 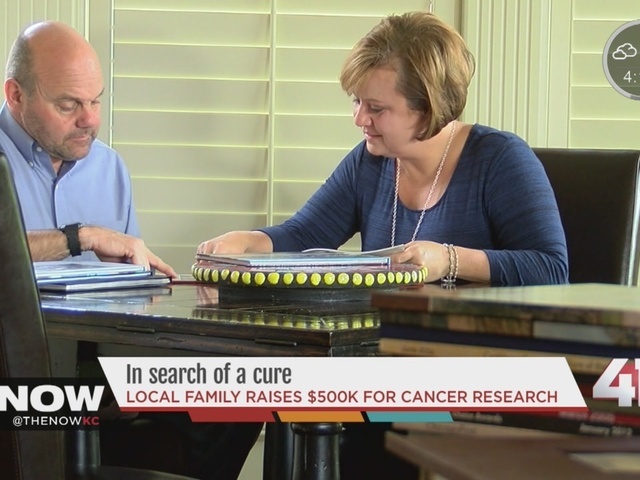 "We decided we were going to do what we could to make a difference," said husband Harry Campbell. "We care, we want to raise money. We want to find a cure because it would make a huge difference to us personally, but there are tens of thousands or hundreds of thousands of people who would benefit from that." Harry Campbell has written two books, Get-Real Leadership and Get-Real Culture, and he tours the nation giving speeches on both topics. All of the proceeds from his speeches and books go to Head for the Cure, a Kansas City organization searching for a cure for brain cancer. So far, he's raised $200,000. The family raises money to find a cure for Kris Campbell and other brain cancer patients. Photo courtesy the Campbell family. "Our goal is to fund, very specifically, the Brain Tumor Trials Collaborative, which helps doctors in hospitals who are trying to find a cure for brain cancer work together online and collaborate and share info, share patient histories and share results," he explained. "It hadn't happened previously. Head for the Cure is the organization that is funding that." Additionally, the family participates in the Head for the Cure 5K walk/run race that started in Kansas City but now takes place across the nation. They've raised $300,000 from the race. "I am 12 years out now, and we have an 8-year-old," said Kris Campbell. "I feel blessed. I think him growing up, watching us really do everything we can to support this cause and make things better for us and also other people fighting this journey, I think that's just a really great model on how you take on difficult challenges. I never thought I would turn 50 years old. I never thought there would be a cure in my lifetime, but I am actually starting to realize that that's a realistic dream." For not only herself, but also the thousands of men, women and children out there who, just like Kris Campbell, want to fill the pages of family photo albums with wonderful memories of a life well-lived. Doctors told Kris Campell she had a five-year 50 percent survival rate and a 10-year 30 percent survival rate. That was 12 years ago. Photo courtesy the Campbell family. Harry Campbell's newest goal is to raise $50,000 over the next 12 months via his speeches and books.